To help race fans get into the Halloween spirit, UPS Racing, Robert Yates Racing and Action Performance Companies Inc., the leader in the design, promotion, marketing and distribution of licensed motorsports merchandise, today unveiled a "monstrous" new race car – the No. 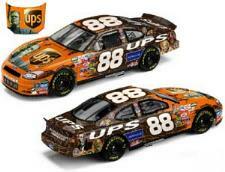 88 UPS/Universal Studios’ Monsters Ford Taurus – that Dale Jarrett will pilot during the NASCAR NEXTEL Cup Series race on Oct. 31, 2004 at Atlanta Motor Speedway. The UPS/Universal Studios’ Monsters Ford, also unveiled today on www.racing.ups.com, features classic characters of horror lore, including Dracula, The Mummy, The Wolf Man and Frankenstein, who adorns the car’s hood. The brown and orange car also is "stitched" together via a design that replicates Frankenstein’s famous sew marks.